Death & Co., which recently rejoiced over its extended hours (now open until 2 a.m. on weekends), rolled out a new cocktail and food menu earlier this week, and I had the pleasure of attending last night's press tasting. The 2 1/2-year-old cocktail den of East 6th Street had a challenging beginning with several legal battles with the SLA/Community Board 3, but this new, inspired menu signals perseverance for the bar and seems to put the past to bed. Co-owner David Kaplan is especially proud of the new food menu by recently-hired Chef Luis Gonzalez, who trained under renowned chef Jean-Georges Vongerichten at Mercer Kitchen. "For once, I feel like we have a food menu that is on par with the quality of the cocktails," said Kaplan. And quality cocktails they are--we started with "Pelée's Blood" (Rhum JM Blanc, Don's Mix #2, homemade grenadine, lime juice, dash absinthe), D&C bartender Thomas Waugh's take on a tiki cocktail. It was a delicious punch-type drink with balanced sweetness, and it made for a refreshing start. The drink was paired with a small plate of tuna tartare with crushed avocado and homemade kettle chips as well as a melt-in-your-mouth pan-seared foie gras with corn pancake and quince puree. Clearly, Gonzalez's dishes elevate bar snacking to a whole new level. Next, I had the "Daisy Buchanan" (Chamomile-infused Old Overholt Rye, Dolin Dry Vermouth, Aperol, and Yellow Chartreuse), created by D&C bartender Joaquin Simo. Solid, strong cocktail, especially if you like a dry finish. 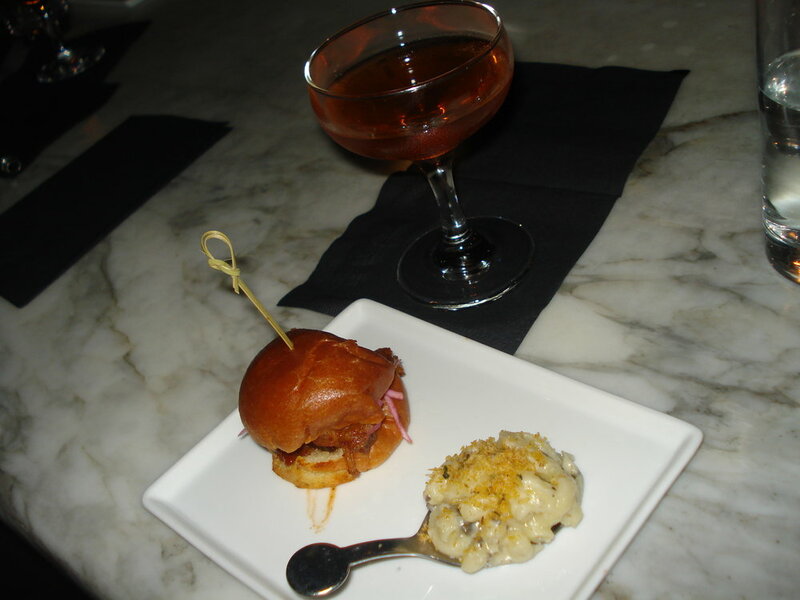 This was a perfect palate-cleanser for the pulled-pork slider and mini-scoop of truffle mac 'n' cheese, which were both highly-satisfying indulgent treats. Then, onto the "Ingenue" (Pierre Ferrand Ambre Cognac, Dolin Sweet Vermouth, Don's Spices), one of D&C bartender Brian Miller's cocktails. The clove-heavy flavors of Don's Spices (a mix of vanilla syrup and allspice dram), made for a rich, autumnal drink that would be perfect for sipping next to a fireplace. This was paired with a mushroom tart with walnut and onion pesto and the crispy pork belly, served with sauteed kale, braised cranberry beans, and pomegranate seeds. Last but not least was D&C bartender Alex Day's "Little Engine" (Famous Grouse whisky, tawny port, apple butter, lemon juice, maple syrup). Served over a mountain of crushed ice with a fresh apple garnish, this drink for me was the most "adult" apple cocktail I've ever tried. The port adds depth to the usual apple pie flavors, and the apple butter infusion coats the tongue without being unctuous. Naturally, this was served with apple cobbler. Special thanks to David for the invite, and to bartenders Jason Littrell and Brian Miller for being so on-point, given all of those new recipes to keep track of. I can't wait to return and try more! If you ever wanted proof of the clash between the crafty cocktail world and the superficial land of clubdom, it was at last week's New York Bar Show, an annual food and beverage trade show. Nonetheless, buzzing through aisles of drink samples and girls in bikinis at Jacob Javits Convention Center certainly isn't the worst way to spend an afternoon. I had hopes of bringing you some news of hot-off-the-presses, must-try spirits or fancy bar gadgets, but alas, I really didn't learn anything new. What I did absorb (besides several sippy cups of tequila, gin, pisco, absinthe, beer, and vodka) is that the mixology side of the bar business has a long way to go to educate mainstream consumers that it's worthy of as much attention as the pretty girls who pour your shots. 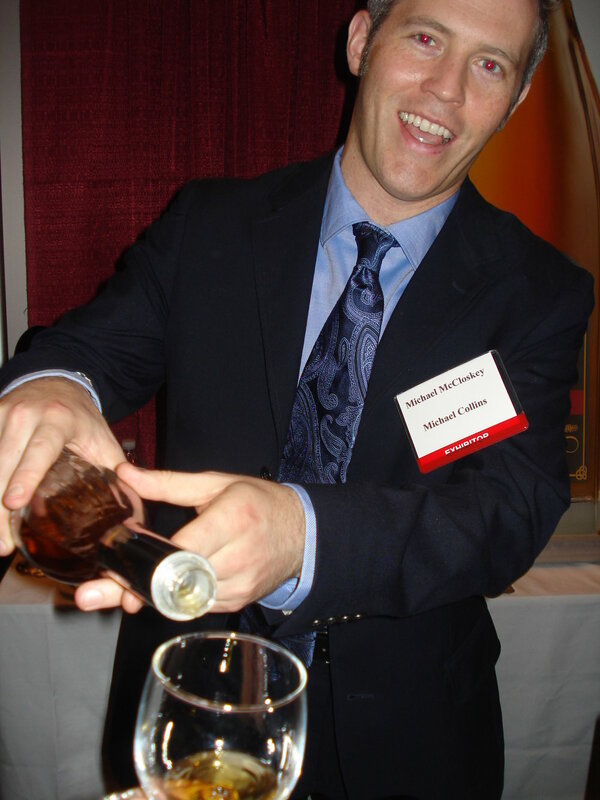 Leading the cocktail teach-in at the Bar Show was the non-stop presentation by the New York chapter of the U.S. Bartender's Guild. When I strolled by, I found mixologist (and talented photographer) Elba S. Giron mixing the Joie de Veev cocktail, of all things, while mixologists Jonathan Pogash and Jason Littrell handed out information and chatted with passersby. Other highlights included: Mekhong Spirit of Thailand cocktails, Pisco Sours with Gran Sierpe, and Daiquiris with Don Q Rum courtesy of James Menite of Porter House. Workshop sessions (which I didn't attend) featured mixologists such as Gary Regan, Charlotte Voisey, Junior Merino, Tad Carducci, Brian Van Flandern, and Martin Miller's brand ambassador Jon Santer. Entertainment came in the form of ice luges, beer pong, Hustlers Club girls, and an inflatable bull (which was just for display, I think). Whether or not this show was the right place to spread the good word of fresh-ingredient cocktails or not, props must be given to the USBGNY for putting in the effort. 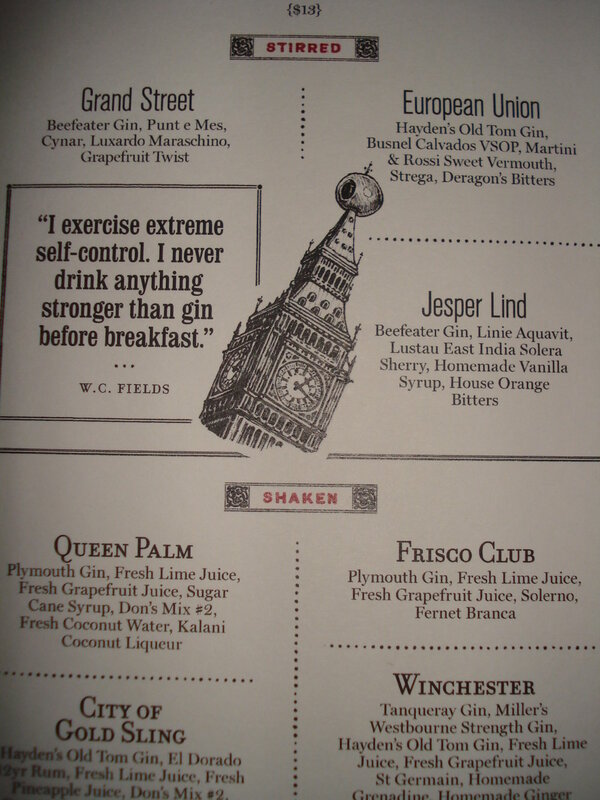 I would love to see more of a cocktail culture presence next year, or perhaps a separate event will emerge. 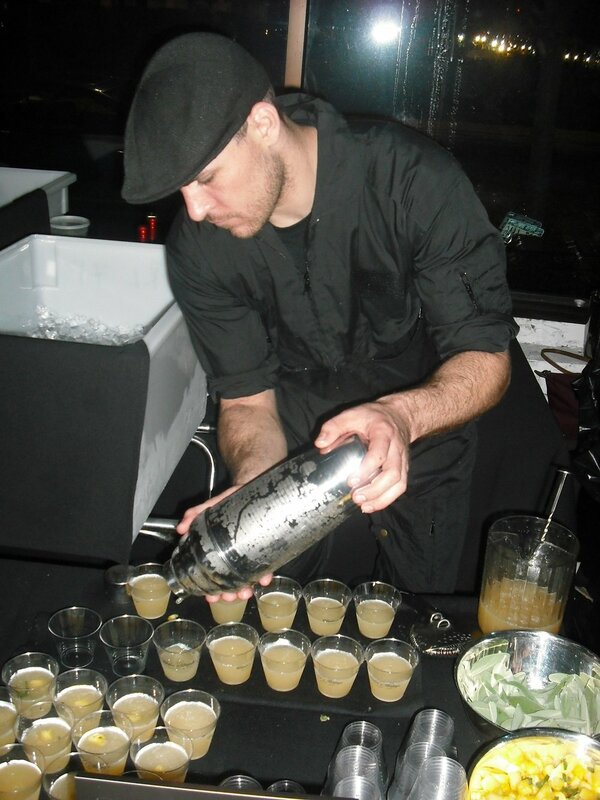 Check out this video of Jason Littrell at the Bar Show making a Southside using Bols Genever.